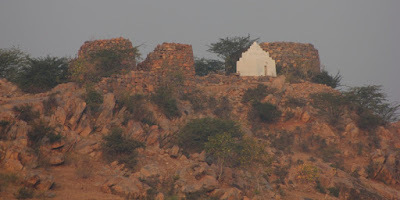 While travelling on the road between Raichur and Mudgal, we passed through several villages; of them handful of them had some historical structures visible from the road. 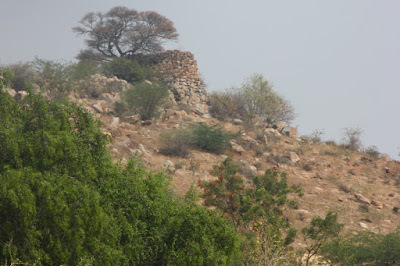 This road connects two important historical places- Raichur and Mudgal; their histories go back to prehistoric times. So the road connecting them should have stop overs for travellers and especially for ruler's convenience there would be smaller forts in between. 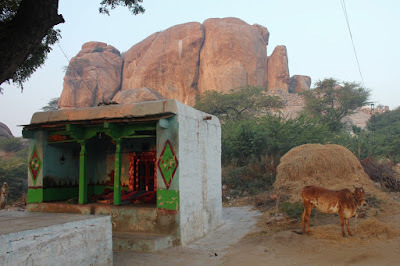 The first one is Navalkal village; its icon being a big rock formation. I'm yet to find what it's name means.. whatever it is it ends with kal ~ stone. From the rock's top right portion, one can imagine a bull's face. Here are the fort walls. It looks small from here but I guess it would be quite spacious inside. I did not go any further lest I disrupted the agenda of the day. 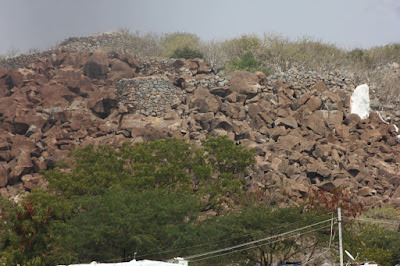 As we proceed further towards Mudgal, we passed through a village named Hirehanagi. The name literally means 'big comb.' The village is situated next to a hillock on which is ruins of a bastion and walls. Seems like a small fort existed here which is in complete ruins now. Further down the road is Watagal, the hill which looks like a tadpole from air seems like a heap of stones when seen from ground level. Its my guess that the name could be derived from the Kannada phrase "Wattidada Kallu" (heap of stones) which turned into one word Watagal. 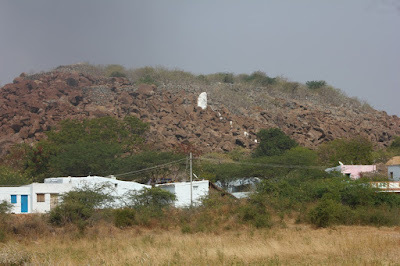 On this hill are ruins of several bastions which indicates this hill was a fort once. 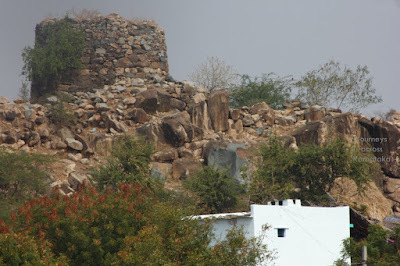 Next is Kotekal fort which is located on a hillock. 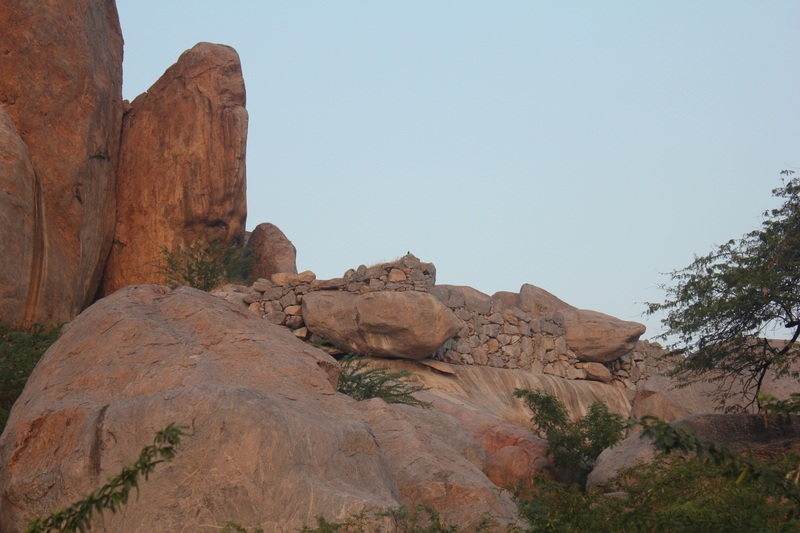 The name Kotekal literally means 'fort stones'. This fort is small compared to Watagal but definitely big in comparison with Navalkal and Hirehanagi. I did not venture into the hill instead took few pictures from the state highway. Here'e the general view from south. 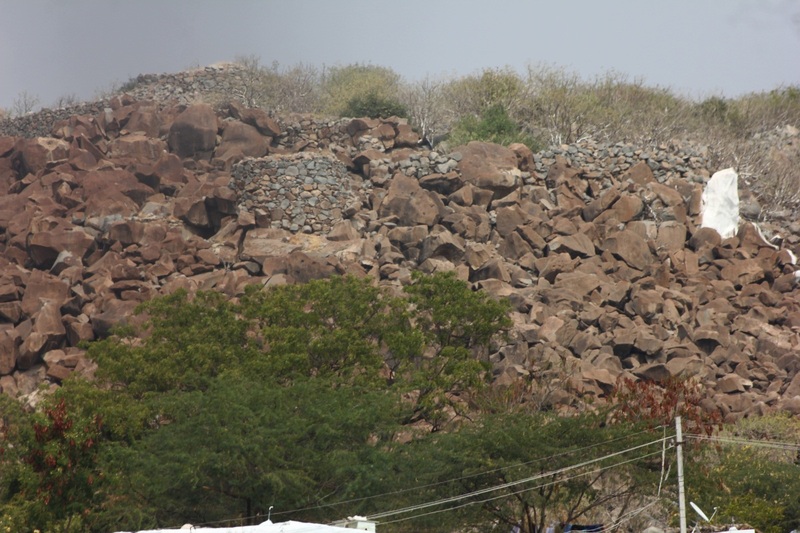 This face of the hill is naturally covered with heaps of stones making it a barrier. However you can see a line of wall built over the heap of boulders. Closer look of the walls. These guys were expert builders indeed. Two of the bastions are fairly well preserved. This one seems like the highest point of Kotekal fort. 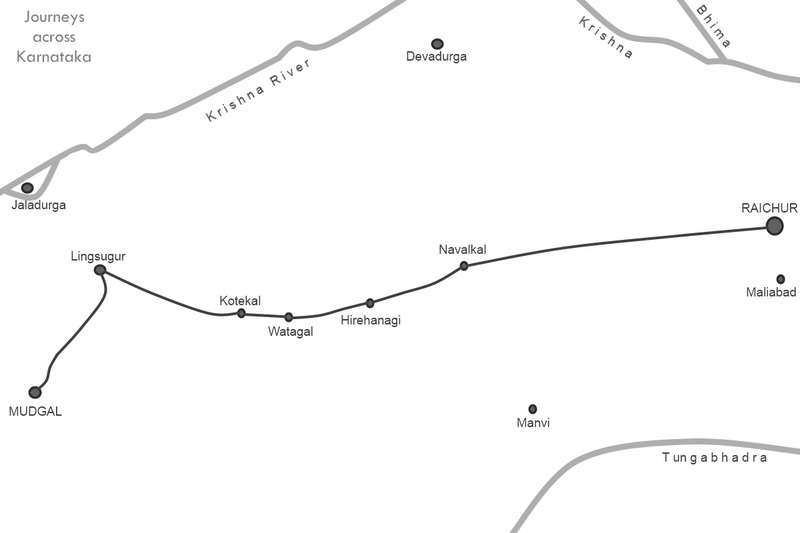 Here's a rough map showing locations of these 3 forts along with other forts of this region. See the beauty of this place- 3 major rivers of Karnataka flow here. 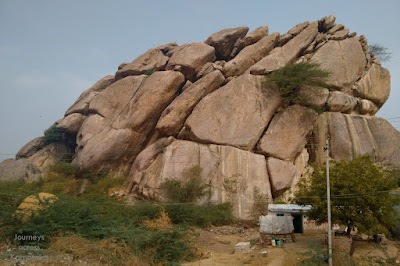 Tungabhadra, Krishna and Bhima. Bhima merges into Krishna and further east near Kurnool Tungabhadra merges into Krishna. 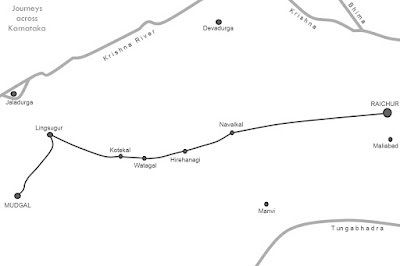 In this area held between rivers, there are 10 known forts and surely few unknown ones too.